Rabbi Meredith Cahn came to the rabbinate through a career in public health, looking at health as comprising all aspects of one’s humanity, including spirituality. Rabbi Meredith is the director of J School, the religious school shared by Congregation Ner Shalom and B’nai Israel Jewish Center in Cotati/Petaluma. 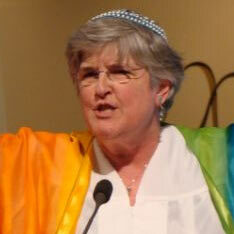 She also serves as chaplain/rabbi at Kaiser Medical Center and at Spring Lake Village in Santa Rosa. She conducts life cycles, especially weddings (which she loves) throughout the Bay Area and beyond. She has served at Congregation Shomrei Torah in Santa Rosa and the Jewish Home San Francisco as an intern and as rabbi of the North Tahoe Hebrew Congregation. Weddings, senior services, bar/bat mitzvah training and ceremonies, funerals, shiva, unveilings.